Picton is the picturesque South Island port town you will encounter upon arrival from New Zealand’s capital, Wellington, via an interisland ferry across Cook Strait. With a population of about 4,000 and dozens of hotels in Picton, New Zealand for brisk tourist arrivals, Picton makes an excellent base for cruises in Queen Charlotte Sound or the bigger Marlborough Sound, day tours to the wine region of Marlborough, and day trips to New Zealand’s bohemian enclave, Nelson. Picton sits at the head of Queen Charlotte Sound which is part of the much larger and ecologically diverse Marlborough Sounds. Except for a maritime museum and quaint seaside cafes and shops, there is little to do in the township itself. But if you are into relaxing or active water sports, the town has a string of accommodation in Picton, New Zealand right in the marina where you can also launch for fishing, kayaking and diving adventures in the calm waters of the Sound. The Queen Charlotte Track, which parallels the Sound of the same name, is ideal for exploration on foot, by bike or kayak. 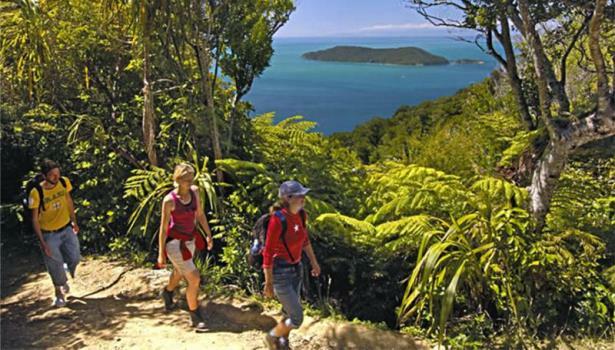 Avid trampers have more than 70 kilometres of walkway from Ship Cove to Anakiwa which afford sweeping views of Marlborough Sounds, Queen Charlotte Sound, and on a good day, Wellington. There is a great range of Queen Charlotte Track Guided Walks, as well as Queen Charlotte Track Independent hikes that can also include kayaking and cycling options. The picturesque secluded bays, coastal bush and verdant islets of the Marlborough Sounds are best approached via chartered boat from your seaside bed and breakfast in Picton, New Zealand. A cheaper but no less adventure-filled alternative is to join a mail and supply run to isolated homesteads in the Sound, or a gastronomic mussel cruise to see where the molluscs are grown and how. Picton also serves as the cruise hub for passengers bound for the Sauvignon Blanc vineyards of the Marlborough Region and the fresh clams and oysters and artsy crafts of Nelson. Conversely, Picton also serves as the jump off point to Wellington about four hours away via an interisland ferry. Wellington itself sits right at the harbour facing Cook Strait, and has a vibrant culinary and film industry. Te Papa, the national museum and art gallery, is located in the capital, as well as the WETA Cave where Lord of the Rings and The Hobbit fans can watch behind the scenes of the trilogies and buy memorabilia.